These are a horizontal tube with the legs welded to the main horizontal tube. The pins are generally welded at 1350mm centres however we can custom build. Maximum load is 100kg secure and evenly spread. Where fitted to original equipment, the manufacturers load limit applies. In the interest of safe motoring, please ensure ladders are secure and protrusions are compliant with your state laws. Ensure your load does not adversely affect the stability of your vehicle. Damage may occur if these products are subject to extreme conditions. FG Falcon Ute fitted with 76mm polished alloy Wide Rax. VE Commodore Wide Rax. 76mm polished alloy rear removable. A VE Commodore Ute with 76mm powder coated "Wide Rax"
A Mazda BT 50 ute with 76mm polished alloy wide rax. Toyota Hilux fitted with our "Wide Rax" in 76mm polished alloy. 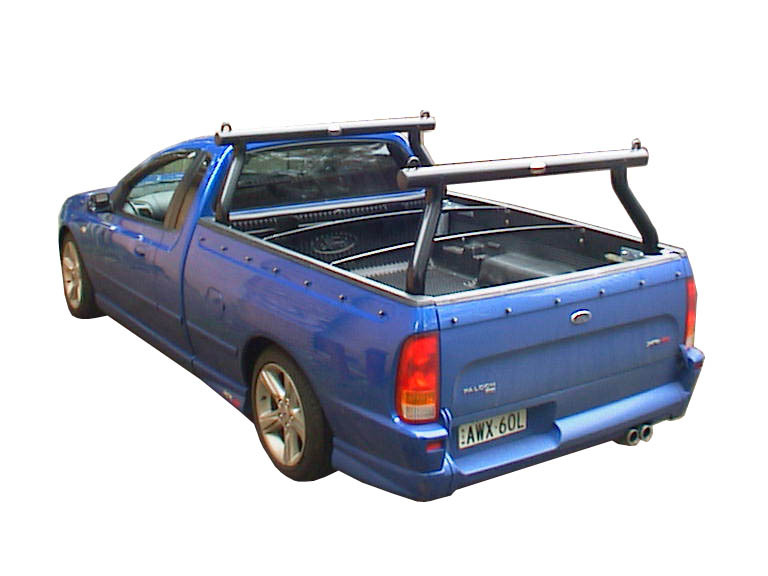 A BF Falcon ute with powder coated "Wide Rax" giving plenty of room across the top of the bar. Over 1300mm. Our "Wide Rax" and "Adapter Kits" feature ladder pins at 1350mm centres as standard but can be made to your specifications.